Irish Activist Deirdre McAliskey on International Women’s Day & Role of Women in Irish Peace Process | Democracy Now! Irish activist and daughter of the world-renowned civil rights activist Bernadette Devlin McAliskey. In 2003, Bernadette Devlin was refused entry into the United States and deported after authorities labeled her a security threat to the United States. Deirdre was traveling with her mother at the time. AMY GOODMAN: Tomorrow is International Women’s Day, held on March 8th every year since 1975. Origins date back to the early twentieth century. On February 28, 1909, the Socialist Party of America held the first National Women’s Day in honor of the 1908 garment workers’ strike here in New York, when 15,000 textile workers marched on the Lower East Side against child labor, for shorter hours, against sweatshop conditions. On Saturday, women are expected to lead gatherings and demonstrations around the world. I’m now joined by Irish activist and actor Deirdre McAliskey. She has traveled to New York to take part in the Convention on the Status of Women that has been gathered at the United Nations for the past few weeks. Deirdre is the daughter of the world-renowned Irish civil rights leader Bernadette Devlin McAliskey, who remains the youngest woman ever to have been elected to the British Parliament. In 2003, Bernadette Devlin was refused entry into the United States and deported after authorities labeled her a security threat to the US. Deirdre was traveling with her mother at the time. DEIRDRE McALISKEY: Thank you, Amy. AMY GOODMAN: How did you get in now? DEIRDRE McALISKEY: Thankfully, I got in because I didn’t leave in 2003. And I think if I had have done, I probably would have had the same stamp on my passport that meant I wouldn’t be at the United Nations this week. AMY GOODMAN: Why didn’t your — why was your mother deported? DEIRDRE McALISKEY: When we flew in at that time into Chicago into O’Hare — and we never really got a straight answer is the honest truth, Amy, as to why at that time she was deported, except, as you say, that it was on the computer in front of the guys at immigration that she was a threat to the security of the United States of America. AMY GOODMAN: —- in addition to her being a British MP — well, an MP in the British Parliament. AMY GOODMAN: Though she was shot up pretty bad. DEIRDRE McALISKEY: Yeah, both herself and my father were both shot and were very badly at that time, and medically there was really no reason for her to have survived as she did, but, as you know, she did, and she’s still there. So I don’t know how she feels about coming back to the United States, although there have been some efforts to resolve that issue since the time. But I don’t think that she necessarily feels very inclined to travel. AMY GOODMAN: So, talk about your work, why you’re here at the United Nations. DEIRDRE McALISKEY: I’m, as you said, attending the Convention on the Status of Women as a part of a cross-NGO delegation from the north of Ireland, and we’re here under the umbrella of the Northern Ireland Women’s European Platform, who have a consultative status at the United Nations. And the particular interest of my organization, which is women into politics, is to challenge what the UK have been doing -— or more importantly, not doing — in the north on Security Council Resolution 1325, which is on women, peace and security, which they have [inaudible] very much claimed the lead on in terms of the Security Council and how women should be represented in decision making and how all conflict resolution and peace-building efforts should have a gender perspective to correct the bounds. And that’s not the case in Northern Ireland. AMY GOODMAN: What is the case now? DEIRDRE McALISKEY: Well, at the moment, we have assembly elections to the Northern Ireland power-sharing assembly, which has been reestablished, and we had elections in 2007. And eighteen women of 108 members of the legislative assembly were elected, so it was about 16.7 percent, falls underneath any European averages. And in terms of devolved governments in the UK, both Scotland and Wales have between 40 percent and 50 percent of women represented. So we’re way down on that. And in terms of public appointments in the north, we have a system of merit only and no gender perspective in terms of involving women. AMY GOODMAN: Have you gotten a chance to speak with members of the British UN delegation? AMY GOODMAN: Why is your sister Roisin still in jail? DEIRDRE McALISKEY: She’s actually now — we’ve just had the case resolved in November, and we had a magistrate in Belfast — Roisin was re-arrested in May last year, which was ten years since her first arrest on the extradition charges, which we presumed were completely over. 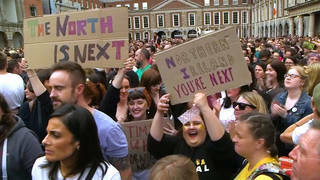 But in November, we had a positive ruling from a magistrate, who said that he would not extradite from the north of Ireland and that her case was now — there had been undue delay and abusive process on behalf of the prosecuting state, so we hope that that’s the end of that. And she’s at home with her family. AMY GOODMAN: She is now. AMY GOODMAN: Well, I want to thank you for being with us for this brief interview. Deirdre McAliskey, here for the Convention on the Status of Women, joining hundreds of women from around the world who have come for the last few weeks to the United Nations in this lead-up to International Women’s Day.